Posted by CCLD in District News. My daughter is crazy about Spiderman. I have no idea where this came from. Suddenly, she responds to everything Superhero. She wants Spiderman sheets, Spiderman shirts, Spiderman novelties of any kind. I even spent the weekend making her Spiderman flannel pajamas, listening to her quietly singing the Spiderman theme song. No, I am not kidding. AND she is in a friendly competition with her best friend who is crazy about Batman! I’ve known Alex since she was three, and never was there a Superhero reference between them. Now, it’s all they talk about. This is all very illogical and out of the blue to me. What has happened? Is it the slew of Superhero movies that have come out that drives this? They both know all the movies and their chronological order, the stars and who was best, their favorite bad guys. They keep themselves entertained by imagining what their superpowers would be if they had some. Thinking back critically, I remember how much my daughter and I enjoyed pre-Superhero entertainment. Teen Titans, and animated show with teen superheroes, was fun and very well written. Winx Club is about teen fairies keeping their world safe, and we never missed an episode. Totally Spies was another favorite – sort of like Charlie’s Angels in High School; not quite Superheroes, but a step above the ordinary for sure. My guess is the girls have been primed for the recent Hollywood output of great Superhero movies from these early experiences, hence the current obsession with the heavy-hitters. I guess it is a positive thing for them to immerse themselves in characters upholding mankind’s standards of what is right and noble. Holy Hollywood, Batman, we’re helping teach them what’s right and wrong! Posted by CCLD in Genealogy / Local History, Reference, Steele. The Genealogy Department at the Steele Memorial library is sending out a plea to all genealogists and others wishing to volunteer to help with our current project of typing the names and dates of the newspaper obituaries from 1961 to 1975 into our catalog. It is not difficult to learn to do this but we need volunteers who are accurate typists, responsible adults, willing to commit to at least two scheduled hours a week to this project, and willing to be trained to use a laptop and microfilm reader. If you think you might be interested, please contact me, Phyllis Rogan, by email or phone. My email is roganp@stls.org; my phone number is 733-8603. If you call when I’m not available, you may leave a message. Please say you are calling about the newspaper obituary project and leave your name and phone number or email address so I can get back to you. Thank you for considering this volunteer opportunity. Posted by schoefflers in Bookmobile. Have you ever wondered where the Bookmobile originated? 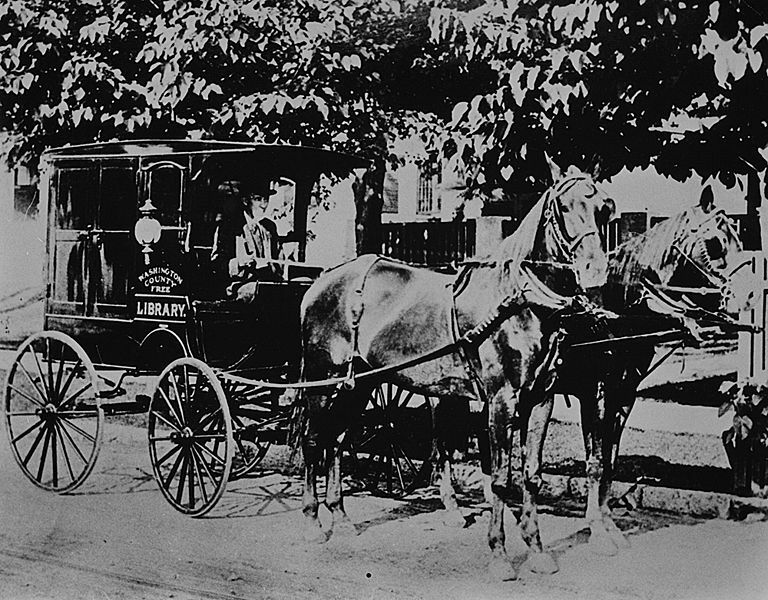 Bookmobiles have dated back as early as the late 1850s. It was a horse-drawn collection of books in the town of Cumbria, England that started its rounds to the community. In 1905, Mary Lemist Titcomb, a librarian in Maryland, for whom the first bookmobile in the United States is attributed to, said, “Would not a Library Wagon, the outward and visible signs of the service for which the Library stood, do much more in cementing friendship?” We have definitely benefited from the vision that several people have had for taking books out to the communities around them. Bookmobiles are also made up of different varieties. In earlier times, a mule-drawn wagon would carry wooden boxes of books to its patrons. In many foreign countries today camels, elephants, and donkeys transport books to their respective villages. An excellent book in our collection for children, Biblioburro: A True Story from Columbia, by Jeanette Winter, portrays the story about Luis, who buys two donkeys and takes books to children in faraway villages. You may wonder how many bookmobiles are in existence today. All states today have bookmobiles, with the exception of Maine. Kentucky leads the way with 98 bookmobiles; New York State has 11 bookmobiles. Yes, the service that the bookmobile provides now not only helps to “cement” friendships, but also brings books, audiobooks, DVDs, and periodicals to those who would not normally be able to come to the library. Visits to schools, day care centers, and assisted-living apartments, etc., make up a large part of our services. A variety of programming is available throughout the year along with participation in several community events. Posted by cclddirector in Community, Director's Comments, District News. The reference desk at Steele has had the pleasure of helping students to do the initial research for books and articles for term papers this month and so I’ve been reminded of an article in Publishers Weekly titled Genes Are in Season — Brains, Too. PW thinks that Sam Kean’s The Violinist’s Thumb may be the most delightful book in the genetics category. Other books on the brain and genes that they like are: The Social Conquest of Earth by the Pulitzer Prize winner, Edward O. Wilson and The Age of Insight: The Quest to Understand the Unconscious in Art, Mind, and Brain by the Nobel Prize winner Eric Kandel. Imagine: How Creativity Works by Jonah Lehrer was on the NY Times Best Seller List this year and Free Will by Sam Harris examines whether our unconscious determines our actions. DNA USA: A Genetic portrait of America by Bryan Sykes is another important new book for those who want to understand the changing face of the American people. Whether you want to understand the latest science about the brain or genetics or just want to understand why you are the way you are; you are sure to find a book at Steele library to answer your question.